In small sauce pan, boil water and cook peas as directed. Once cooked, strain and set aside. Head pan and add pat of butter. Add garlic and sautee until aroma is released but not garlic is not brown. Add zucchini slices and asparagus. Sautee together until vegetables are softened. Add a bit of water to help sautee the veggies. Keep heat on medium-high. Once vegetables are cooked, remove from heat. In large stockpot, add asparagus, zucchini and peas. Add water until vegetables are nearly covered. Turn heat high and bring to a boil. Once boiling, lower heat and simmer for 10 minutes. Season with salt, black pepper and cayenne pepper or Spike. Turn off heat and ladle batches of the soup into blender. Blend in batches and return to stockpot. 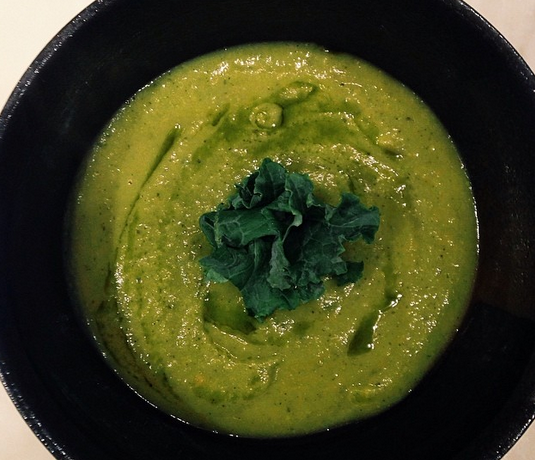 Serve soup in bowls and garnish with fresh kale and hemp oil.